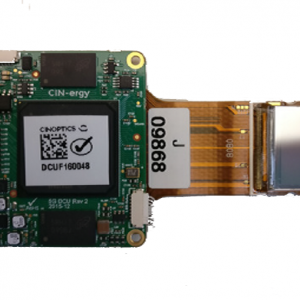 CINOPTICS’ in-house developed electronics platform is now available to build your own Near-To-Eye solution. Full-HD NTE kit: Compact single board Full-HD micro display solution with external sensor support and audio. The latest in (AM)OLED micro display technology using Full-HD resolution and extreme high contrast. The complete compact system can be powered and controlled using a single small USB Type-C cable using the latest USB3.1 technology. Connects to any computer, regardless of used OS, like a Displayport monitor. No additional hardware and/or software is required for system operation. External sensor interfaces available. Plug and play (camera) sensor support for USB devices. FLCoS NTE kit: Complete modular FLCoS micro display solution for monocular and binocular imaging applications. Highest image quality with use of the reflective FLCoS (Ferroelectric Liquid Crystal on Silicon) microdisplay technology. Modular system that can be configure for single and dual display systems with individual control. Connects to any computer, regardless of used OS, like a displayport monitor. No additional hardware and/or software is required for system operation. No lens distortion correction software is required. Compact size electronic modules with flexible interconnects for easy integration in space critical applications. External sensor interfaces available. Additional Plug and play external USB port supported on board.